GAPP is one of very few exchange programs based on long-term, sustainable partnerships which are not only between students, but between teachers, administrators, schools, and communities. GAPP is the largest and most successful bilateral student exchange program of the US with any other country. GAPP is supported by the German Foreign Office as well as The U.S. State Department. GAPP, Inc. is a 501(c)(3) Public Charity under oversight of an independent Board of Directors, consisting of eight renowned and accomplished members of private and public institutions. Donations are fully tax-deductible to the extent allowable by law. The German American Partnership Program is dedicated to creating intercultural learning opportunities that forever impact the lives of countless students in Germany and the US. 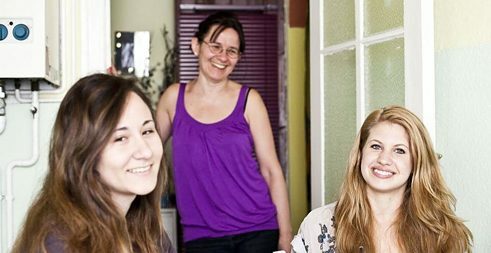 Our objectives include the initiation and development of student exchange programs between the United States and Germany, inspiring intercultural understanding, promoting German language instruction and motivating personal friendships. GAPP is one of very few exchange programs based on long-term, sustainable partnerships which are not only between students, but between teachers, administrators, schools, and communities. In addition to its patronage, GAPP, Inc. contributes financial support under certain conditions. As a nonprofit organization, all our proceeds go towards our mission. GAPP exchanges are rooted in long-term school partnerships and so become part of the communities in which the schools are located. The mutual short-term exchanges take place in regular intervals between German and US schools. Groups of 10-20 students visit their partner school for at least 2 weeks and stay with the families of their exchange partner during this time. Having had a successful short-term exchange, individual students may also spend a semester or a full academic year at their partner school. Most GAPP groups travel every year or every other year. This way, the international visits become a well-known fixture in the communities and not only participating students, families, and teachers benefit from the reciprocal and regular visits, but also school administrations, local media and public figures. They all get acquainted with the international visitors and their culture, which not only broadens horizons but leads to intercultural understanding and openness that lasts a life-time. Thank you for considering to support GAPP! Your donations play an integral role in helping us to maintain, develop, and strengthen the quality and diversity of our international exchange programs and services. allowing students to return with knowledge and an understanding of a foreign culture that will shape their entire future and can lead to enduring positive relationships. GAPP is proud to work with these open-minded young students who are interested in intercultural dialogue and want to broaden their views within the framework of an educational exchange. our convenient donation form on our website under the tab "Support GAPP"
sending a check to German American Partnership Program, 30 Irving Place, New York, NY-10003. selecting the German American Partnership Program on AmazonSmile. This is a simple and automatic way for you to support your favorite charitable organization every time you shop at Amazon, at no cost to you. selecting GAPP on PayPal Giving funds when shopping at participating vendors such as Humble Bundle, ebay, etc. GAPP is particularly grateful to all generous alumni, partners, and individual donors for allowing GAPP to support economically disadvantaged students who want to make the most of their high school education. Through this critical financial support, GAPP is able to provide them with the scholarships and funds they need in order to do so. GAPP is a 501(c)(3) Public Charity. Your donations are fully tax-deductible to the extent allowable by law. You will receive a receipt for your donation. Since its original inception in 1972 at the Goethe-Institut Boston, GAPP has developed into the largest and most successful bilateral student exchange program in the US with any other country. With 765 active school partnerships, GAPP remains the strongest youth exchange link between American and German secondary school students. GAPP was greatly expanded in 1982 and 1983. As a result of financial participation from the American as well as from the German side, the program received a stimulus which has been sustained to this very day. The number of school partnerships has increased from 150 in the early days to almost 800 today. Up to now, more than 300,000 students have participated in GAPP.